Sandra Ingerman teaches workshops internationally on shamanic journeying, healing, and reversing environmental pollution using spiritual methods. 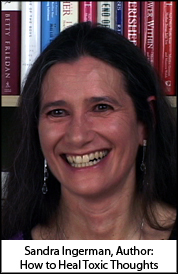 She has trained and founded an international alliance of Medicine for the Earth teachers and shamanic teachers. Sandra is recognized for bridging ancient cross-cultural healing methods into our modern culture, addressing the needs of our times. Sandra is a licensed Marriage and Family therapist and Professional Mental Health Counselor. She is also a board-certified expert on traumatic stress and certified in acute traumatic stress management. The author of several valuable books, Sandra lives in New Mexico. Her website Sandra Ingerman is well worth a look! 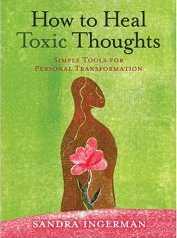 This article is an exerpt from a new book, How to Heal Toxic Thoughts, by Sandra Ingerman. Words as Seeds contains a brief history of the power of words and a visualization exercise for growing a verbal garden of love. More information about the book, How to Heal Toxic Thoughts, and how to buy it, follows the excerpt. Enjoy! Words hold a tremendous amount of power. They affect our relationships with others as well as what we end up creating in the world, and they are powerful tools for transforming the energy we project. I see words as seeds. Every time we plant a seed word, it will grow. 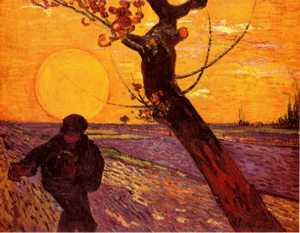 In the garden of your life, are you planting seeds of love or seeds of hate and fear? Various ancient cultures understand the power of words and so treat them with great respect. The Navajo people have a saying: May you walk in beauty. Whenever someone from the Navajo nation attends one of my lectures that includes a discussion on of the power of words, he or she always comes up to me and explains the significance of the phrase. Essentially, it means don't say anything to another person unless it will create beauty in his or her life. Hebrew and Sanskrit are what we call vibrational languages. In Sanskrit it is believed that when you say a word, the vibration from that word goes up into the universe and comes back down as a physical manifestation. One Hindu creation story tells that the world sprang forth from the skulls of the goddess Kali's necklace. Each skull was a letter in the Sanskrit language. There are stories in the Hebrew tradition, too, about how words can be used to heal or harm, to create or destroy. Hebrew is also called a consonantal language, meaning that it is made of consonants and not vowels. That is because the sounds and vibrations of the vowels are the real power; the consonants are what contain the power and therefore define the parameters of the power coming through. By not writing out the vowels, the language keeps most of the powerful words secret. You have to be told which vowels are used in a particular word. Also, a word could be an extremely powerful word using one set of vowels, but an ordinary word using another set of vowels. The Qabbalists say that the world was created by the letters of the alphabet, meaning through the use of sound and vibration. The Hebrew bible embodies the very sound of creation, the vibrations that actually were used to create and manifest. Therefore words are "creative," and if they are creative they can also be destructive. In ancient Egypt, action and words were often the same thing; words had so much power that often a metaphor was used in the place of a word. Otherwise, it was thought that the energy of the word – potentially destructive – would manifest physically. The creation stories of many cultures teach that the world was created with a sound or a word. Genesis says that God created the world with the words, Let there be light. The New Testament says, In the beginning was the Word, and the Word was with God, and the Word was God. In the cosmology of the Hopi, the sun god and earth goddess chant life into being. The Hindu scriptures teach us that aum is the sacred syllable from which the entire universe was created. Even abracadabra, the incantation that many of us said as children, is actually a word of power that comes from the Aramaic. The original spelling is abraq ad habra, which literally means, I will create as I speak. Here is a simple exercise to try. First, read through the following visualization or ask someone to read it aloud to you. Or, if you like, make a recording of yourself reading it. Then get into a comfortable position either sitting up or lying down, either in nature or in your home. If you do this at home, you can put on some relaxing music that helps you move into an expanded place. Think of a place in nature that you like to visit. In the previous chapter, you spent quiet time thinking about this special place. You might go to the same place now, or think of a new one. Find a nice rock or a place on the earth where you can sit. Experience yourself being there with all your senses alive and open. Look around you and see all that there is to see in this place. Hear the sounds of nature around you. Feel the breeze on your skin and the ground or rock beneath you. Smell the fragrances. Taste the air. As you sit in this precious spot on earth, start to say out loud some of the words you commonly use. Notice the vibration that travels out into the air and up into the sky. Here are some words to get you started. Try saying the word, brilliance. Notice the invisible energy around this word. Now try saying the word, radiance, and notice what vibration is being sent out with this word. As you sit in this place, try words you use in your daily vocabulary. Notice what you send out and how it is affecting the energy field of the planet and of the web of life. Notice what is raining back down on you as the energy you send out returns and manifests in your physical world. Notice what seeds you are planting in your garden of life. Practice words as long as you wish. When you are done, reflect on what you have learned about how to create a beautiful life-garden. And when you feel ready, take some deep breaths and experience yourself returning to the place you are lying or sitting in. Allow your breath to connect you with your body and the earth. And when you are ready, open your eyes. When I offer this exercise to my students, they're often surprised to realize how often it is not the word itself but the intention behind the word that makes a difference. In our culture, just as we don't look at the energy behind our thoughts and emotions, we don't look at the power behind our words; we don't consider what plants will grow from the seeds we plant in another person's psyche. At a conference, I led a group of health professionals through the same exercise you just completed. I asked them to watch the vibration coming out of the words they use when they gave medical diagnoses to their patients. The exercise had a big impact on them as it opened their ears to the effect their own words could have on their patients – not just at the level of information, but at a deeper level. She is also the author of The Soul Retrieval Journey, The Beginner's Guide to Shamanic Journeying and Miracles for the Earth lecture programs produced by Sounds True. Sandra teaches workshops internationally on shamanic journeying, healing, and reversing environmental pollution using spiritual methods. She has trained and founded an international alliance of Medicine for the Earth teachers and shamanic teachers. Sandra is recognized for bridging ancient cross-cultural healing methods into our modern culture, addressing the needs of our times. Sandra is a licensed Marriage and Family therapist and Professional Mental Health Counselor. She is also a board certified expert on traumatic stress and certified in acute traumatic stress management. Available through bookstores or from Amazon.com. "Ingerman's creative, multi-pronged plan for healing is gentle, practical and encouraging, making it a fine resource for the overstressed." How to Heal Toxic Thoughts teaches readers how to identify toxic thoughts, transmute negative energy, and shield themselves from the harmful influences others project out of ignorance. Filled with pragmatic tools for coping with negative thoughts and emotions, Ingerman helps readers transform toxic thoughts into feelings of peace, harmony, and love. "Sandra Ingerman beautifully explains how our thoughts create our lives and impact others. All the while, she restores the light and magic from deep in our souls." Copyright (C) 2007 by Sandra Ingerman. All Rights Reserved. Please feel free to duplicate or distribute this file as long as the contents are not changed and this copyright notice is intact. Thank you.